AMZScout web application does not require any installation. It works through any internet browser. Just visit the website and click the “Sign Up” button in the top right if you are not registered yet. It is possible to register using Facebook, Google or Weibo, as discussed further below. 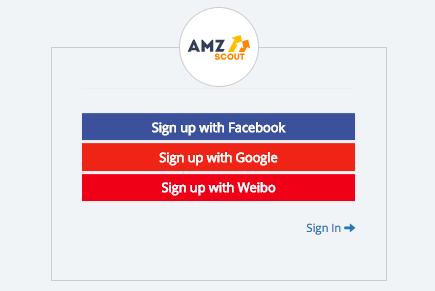 Once the registration process is completed, you can sign in to the AMZScout web application. The web application has 3 different plans: Basic, Start, and Business. The functionality of these plans are all the same, the only difference being in the number of products you will be able to track using the Product Tracker. You can choose the most appropriate plan for you by determining the number of products that you need to track. Fees can be paid monthly or yearly. Before buying it you can even try it for free for 7 days. Visit the AMZScout website and click “Sign Up”, if you are not registered yet. You can register with 3 available options choosing from Facebook, Google or Weibo. If you already have a Google or a Facebook account, you can login using the same username and password. If you are a new user, you can create an account using Google. 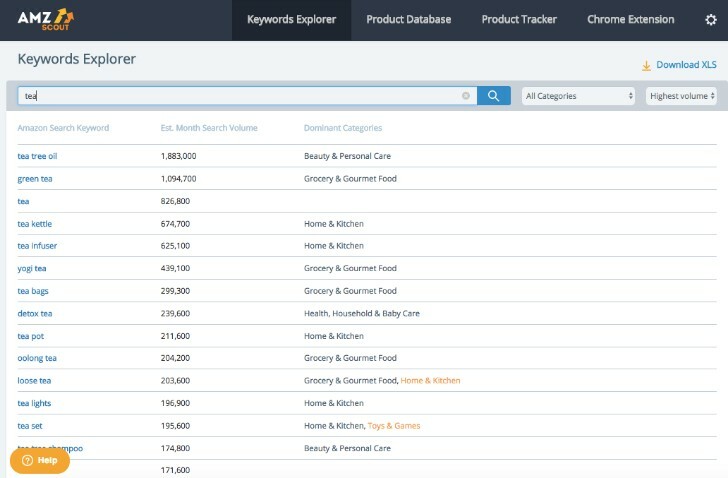 It allows you to check estimated monthly search volumes for different keywords. It also shows dominant categories. The results can be sorted by any column. 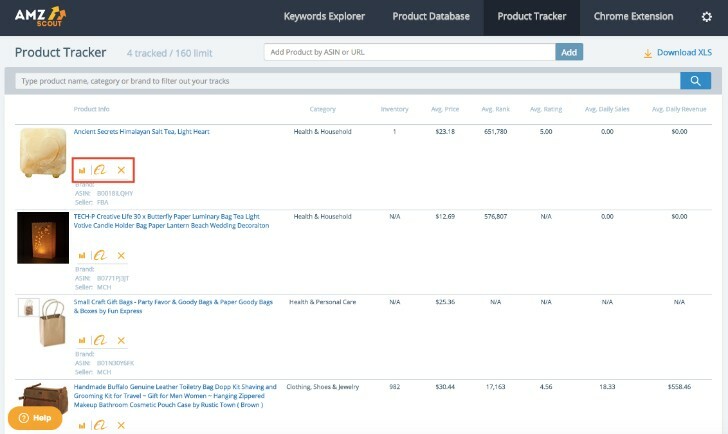 In the Product Database you can see products that are related to a keyword. Use the button ‘Add Filter’ to filter only products that suit your parameters. You can click on the ‘Trends’ button to check up to 5-years of Google Trends for a particular keyword. You can also click the button with 3 vertical dots on the right to add or remove some columns in the spreadsheet. The results can be sorted by any column. It includes products that you are tracking. Under every product you will find 3 buttons. The first one is to check sales, rank, inventory, reviews and rating history (for: 7 days, 14 days, 1 month, 2 months or 1 year). The second button is an AliBaba search. It opens a new tab in your web browser with Google search results by Alibaba. Click on the picture of a suitable product and then click the button “Visit” to open an Alibaba page with full product details. The third button allows you to delete the product from the tracking list. It redirects you to the website page with the Chrome extension. 5. Settings (the gear icon on the top right). In this tab you can change your marketplace, your password, or check the available licenses. To buy the AMZScout web application, enter the web app and go to Settings by clicking the gear icon on the top right corner. You will see the information about available licenses and the option Buy for those that are expired. If you want to change the type of your subscription, please contact AMZScout support team. If you want to buy a yearly subscription at a special rate of 50% off, please contact AMZScout support team as well. The web application can be purchased by using PayPal only. If you don’t have a PayPal account yet, you can create one absolutely for free. If you still would like to pay using a different payment method, please contact our support team. If you already paid for the web application, but don’t have access, please fill out a special form in the web application payment page. Our team will check your payment and solve the issue within 24 hours. How to see the account information (license)? To see your account and license information you need to sign in to your AMZScout web application. Afterwards, click the gear icon in the top right corner to open Settings. You will see the information about licenses. If you are looking to change your marketplace in the web application, please sign in to your AMZScout web application and go to Settings by clicking the gear icon in the top right corner. You can change the marketplace in the drop-down menu, which is located on the top right of the window. You can change your password for the web application easily. To do this, please sign in to your AMZScout web application and go to Settings by clicking the gear icon in the top right corner. You can see 3 fields (current password, new password, confirm new password) to change your password. 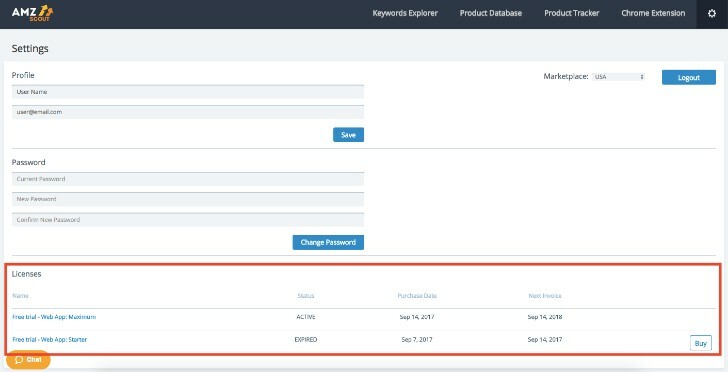 Find the keyword using the Product Database (or Keyword Explorer). 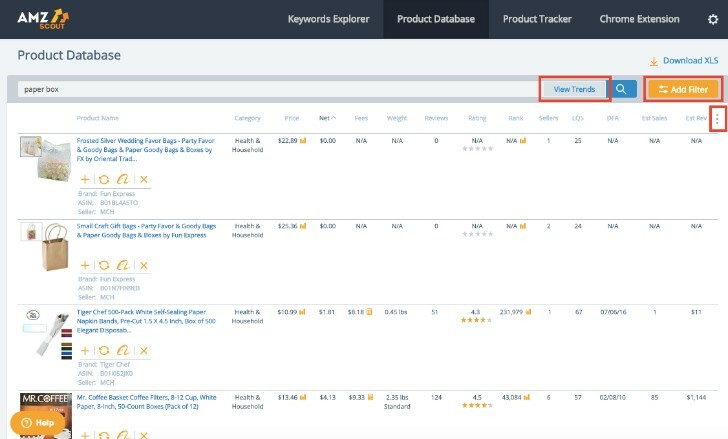 Click the button “View Trends” next to the search bar in the Product Database tab. How can I change my plan for AMZScout web application? To change your plan for AMZScout web application, contact AMZScout support team.